Plans for new adventure centre revealed as seaside village aims to exploit Wild Atlantic Way potential. FITNESS: Sportswoman Sarah Rowe shows Ciaran Hayes around the new facility. 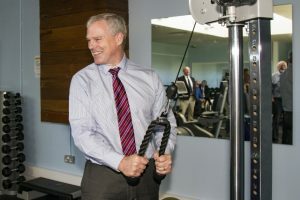 The new gym at Waterpoint in Enniscrone was officially opened on Friday last, June 3 by Ciaran Hayes, CEO of Sligo County Council. Speaking at the launch, Chairman of the Waterpoint Board of Directors, Dermot O’Regan said, “Being awarded €44,000 under the Sports Capital Grant from the Department of Transport, Tourism and Sport was the catalyst for this development. I would like to thank Minister Michael Ring TD for supporting this project”. The new gym is located at the rear of the facility with separate changing facilities and access points. The hall where the old gym was located has been redeveloped into an indoor play centre for birthday parties, school tours and children’s camps. The launch of the new gym was also used by Dermot O’Regan to reveal future plans for the facility. Visitor numbers from home and abroad to Enniscrone have been increasing steadily since the launch of the Wild Atlantic Way route by Failte Ireland in 2014.